We’re having some old friends over for dinner tomorrow. We haven’t seen them in a while so I’m really looking forward to it. For the dinner, I thought I would keep it simple so I’m making a slow-roasted beef brisket with mushroom gravy, roasted potatoes, and steamed broccoli. But for dessert, I wanted to serve something that would be easy to prepare and yet be fancy enough to make a statement. 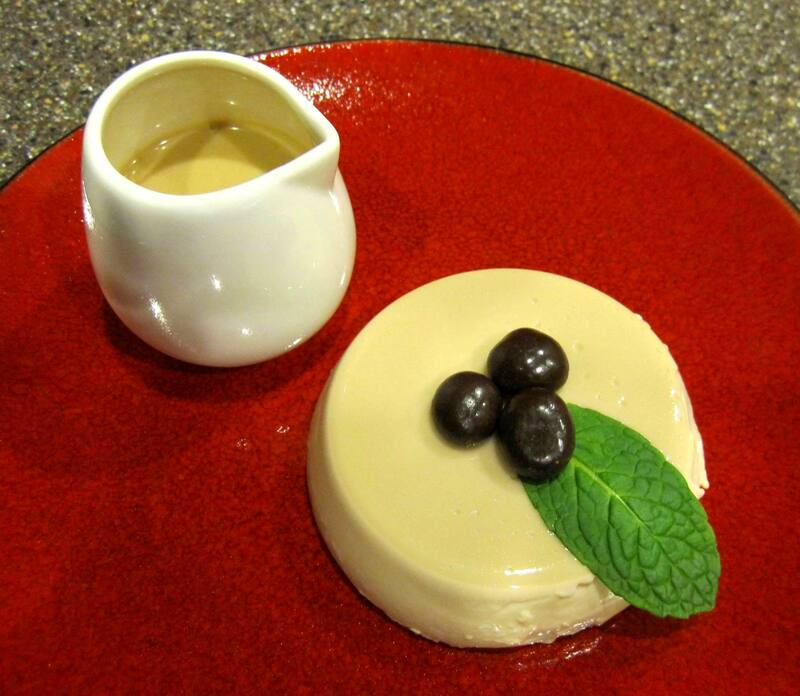 I decided to make Panna Cotta but didn’t feel like doing the traditional vanilla flavor. Then I thought, ‘how about coffee flavored?’ It would jazz up the custard quite nicely and make it sophisticated enough to appeal to the grown-up palate. If I could come up with some kind of sauce to serve it with, that would be the icing on the cake!….. or the icing on the cotta….. LOL! I must say, I think it turned out pretty well! I hope my friends, Maureen and Bullet, like it too. Place whipping cream, sugar, instant coffee and vanilla extract in a saucepan. Stir over medium heat until mixture comes to a simmer. Remove from heat and add gelatin to hot cream mixture, stirring until gelatin dissolves. Pour into 6 lightly oiled 1/2 cup ramekins or other small containers and refrigerate overnight or at least 8 hours. 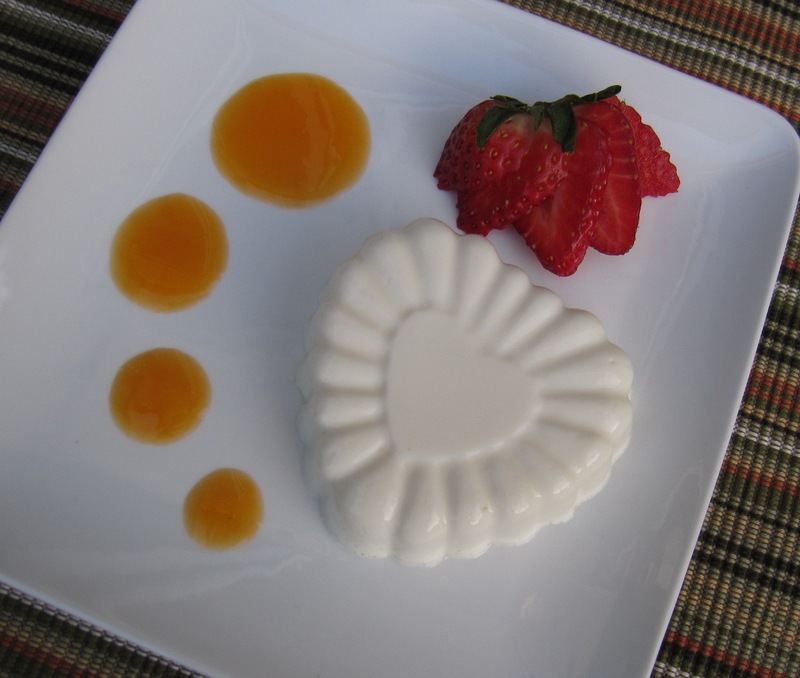 Once panna cottas are firm, turn out onto dessert plates. Decorate with chocolate covered espresso beans and mint leaves. If desired, serve with Coffee Cream Sauce. My family loves creamy, rich Panna Cotta, but let’s face it – it’s not exactly the lowest calorie dessert out there. However, I do have the Weight Watchers PointsPlus Cookbook sitting on my bookshelf, and browsing through it I was more than pleased to discover that it contained a recipe for a low-fat Panna Cotta! I decided to give it a try and was pleasantly surprised. Of course, there’s nothing like the flavor of a full-cream Panna Cotta, but when you’re trying to cut down on the calories, this really was a good substitute. Spray four 6-oz. custard cups or ramekins with nonstick spray. Sprinkle gelatin over 1/2 cup of the half-and-half in small bowl. Let stand until gelatin softens, about 5 minutes. Meanwhile, combine remaining 1/2 cup half-and-half, 1/3 cup of the sugar, the lime zest, and salt in medium saucepan and set over medium heat. Cook, whisking, until sugar is dissolved, about 2 minutes. Increase heat to medium-high, bring just to boil, and remove saucepan from heat. Whisk in gelatin mixture, cover, and let stand 10 minutes. Pour through fine sieve set over medium bowl. Whisk buttermilk and vanilla into strained mixture. Divide mixture evenly among prepared custard cups. Refrigerate until thoroughly chilled and set, at least 4 hours or up to 1 day. To make sauce, combine 1/2 cup of the raspberries, the blueberries, remaining 1 tablespoon sugar, and the water in small saucepan over medium-high heat. Bring to boil and cook, stirring often, until blueberries pop and sauce begins to thicken, about 2 minutes. Remove from heat and stir in remaining 1/2 cup raspberries. Cover and refrigerate until ready to use. To serve, run thin-bladed knife around edge of each custard cup; then dip cups into bowl of hot water, holding them there about 15 seconds. Immediately invert cups onto plate. Top each with 2 tablespoons of the sauce. NOTE: I followed the Panna Cotta recipe as is, but I didn’t have any raspberries or blueberries so instead of making the Berry Sauce, I made an Apricot Sauce to go with it by first draining a can of Lite Apricot Halves, and then pureeing the fruit with an immersion blender. Stir in a little squeeze of lemon juice and you’re good to go. If you want it sweeter, just add some Splenda to taste. 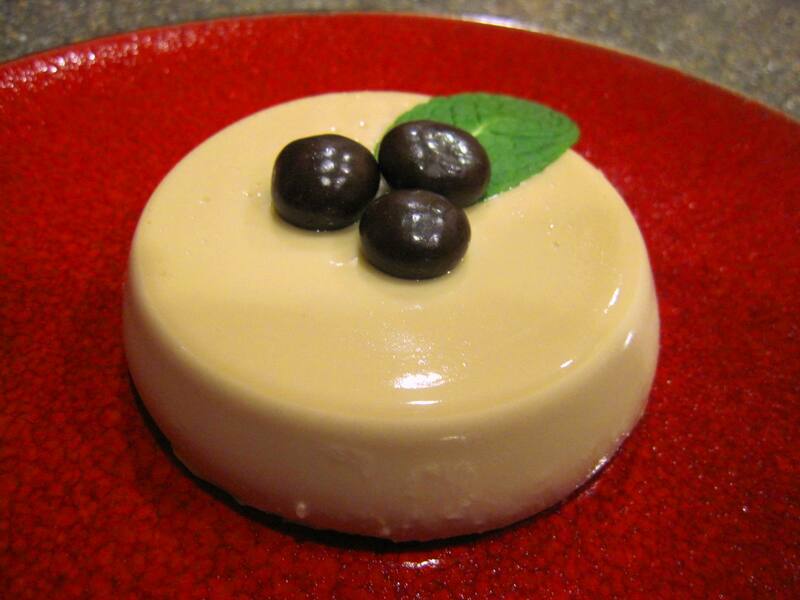 Panna Cotta is an Italian custard dessert. Panna Cotta literally means “cooked cream.” My kids love Vanilla Bean Panna Cotta which I usually serve with different fruit sauces, but since strawberries are in season, I thought I would try making Strawberry Panna Cotta by switching the vanilla bean for strawberry extract and making a strawberry sauce. They liked it a lot so I made it again to take to my sister’s house for Labor Day. It was a hit. Place cream, sugar and strawberry extract in a saucepan. Stir in a few drops of food coloring until mixture reaches the shade of pink desired. This is optional. You could skip the food coloring if you want. 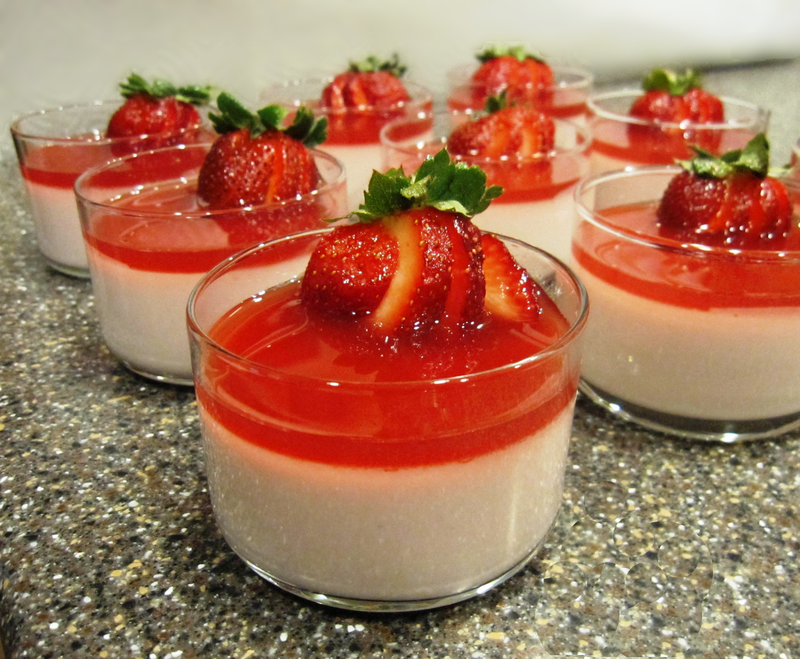 Once panna cottas are firm, pour a little strawberry sauce on top. 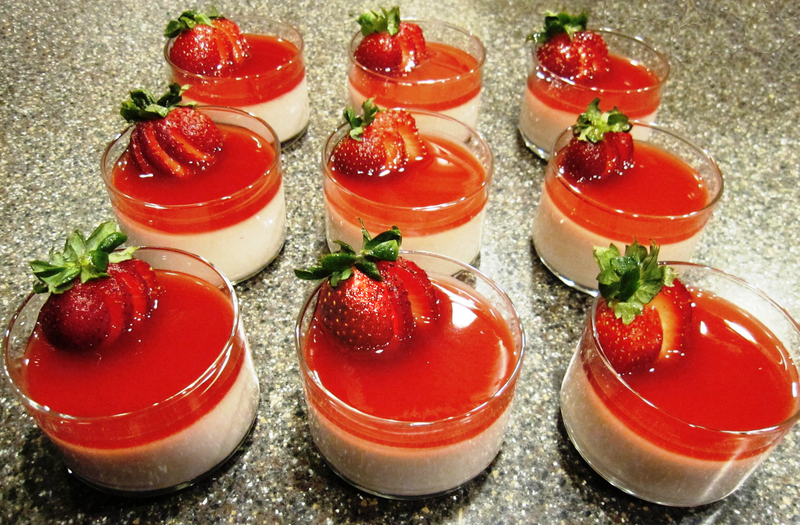 Decorate with sliced strawberries and mint leaves, if desired. Blend strawberries and orange juice together until smooth. Add sugar to taste. How much sugar you add will depend on how sweet your strawberries are. Just add in one tablespoon at a time until it’s as sweet as you want it.